Today I’m sharing my thoughts on a question that a group of blogger friends are also writing about: What words are off-limits in your house? We have the standard no-no words. Those I grew up calling “cuss” words. I don’t even know if the littles have heard these words yet. In our previous life, Aub heard them a lot, so I’m even more thankful she chooses not to say them. I can’t help it–I just cringe when I hear one. I’ve told Aub to be more creative than that–those words can just give the wrong impression in some situations. Growing up the grown folks would tell us “Papa killed can’t.” I always found the visuals in my head on that one rather fascinating. My Papa? Really? We were reminded of this “fact” quite often. Because we tended to say it quite often. I can’t eat that. I can’t pick up my room. I can’t figure this out. I can’t be nice to my sister. Another word that was forbidden growing up was lie. It wasn’t “don’t lie,” it was “don’t tell stories.” You didn’t accuse someone of being a liar, he or she was a storyteller. I don’t even know, but I do know that my skin crawls if my children say the “l” word. There are words that are off-limits because of preference. In college our director over the Resident Assistants refused to let us say dorm–they were Residence Halls. Still today when I’m talking to Aub about her *gulp* dorm room, I look around waiting for someone to jump on me for it. And there are words people can’t handle hearing. Like Aub and the word “glands.” Want to creep her out? Say glands. And “dead cat” will cause our Princess to give up eating any kinds of soft foods for three days. Truth. Don’t even ask how I know this. Then there are the bathroom words. Used in context I’m cool. But for a while Cooter seemed to think his existence was based on how many times he could say those words in a day. Out of context. I assured him that his life did not depend on saying those words, but that his well-being might just depend on him not. Oh my. There are also the name calling words. I wish I could say the words are never said in this house, but unfortunately they are from time to time. And the repercussions follow. Such words as dumb, stupid, hate, idiot–no no NO! And I don’t allow them to comment on people’s bodies (including their own)–fat, skinny–no ma’am. Folks can’t help how they are built. Let it go. There are better things to talk about. But there’s one word I don’t want to ever hear in my house again. It occurred to me the other day (be prepared for what we call TMI–Too Much Information) when I was *ahem* in “the little girls’ room.” There was no toilet paper. How does that even happen? But it does. (There is an episode of a Disney show where the Mom is texting her family ITBWOTP…..”in the bathroom without toilet paper”–cracks me up every time.) So I hollered. There is nothing to do but HOLLER when you are stuck like that. And hoped that one of the littles would hear me. And then I said the word. And finally Cooter showed up to rescue me. 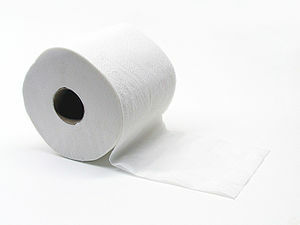 With one roll. It’s his job to keep the bathrooms stocked. I suppose since it’s his job I wish he had thought to bring more than one but at least I was no longer stuck. Still when one is notifying the entire house and possibly this whole end of the street that she is in such a predicament, should she really have to clarify with a “NOW!”? As I sat there waiting, with nothing else to do, I thought about that word. How many times in a day I say it. Go pick up your room. Now. Please come unload the dishwasher. Now. It’s time to do Math. Now. It’s time to go to gymnastics/the grocery store/the allergist. Now. Do any of these really need a time clarification? Or maybe I’m just not parenting properly. So I’m going to try to remove it from my repertoire and be more intentional in instructing my children….so they will hear me and follow directions right away. Yeah. A Mama can dream, can’t she? For more stories about forbidden words, head over to Modern Family in Modern America, who is hosting this week, and there will be more stories linked at the bottom. I never thought of outlawing “lie” and “liar.” What a good idea!